The second option similarly focuses on areas experiencing higher than normal incendiary ignitions or the area burned by such fires (Option 5.b, figure 3.14). 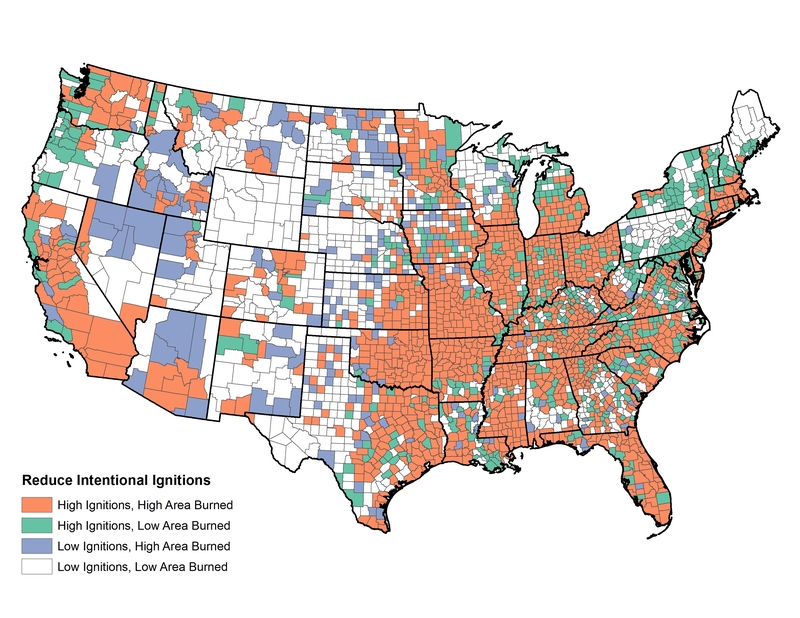 There is more congruence between ignition density and area burned with incendiary fires than with accidental fires. Thus, large portions of the East and more populated counties of the West exhibit a combination of both high incendiary ignitions and high area burned. The NSAT assembled data sets that include a broad set of community metrics and more detailed causal information that can be explored to target specific causal factors within the various community contexts. For example, debris burning is one of the principal causes of accidental fires; its occurrence varies considerably among community clusters. Conclusion: Human-caused ignitions, whether accidental or incendiary, are a universal problem that affects much of the United States. Targeting regions or counties with higher-than-normal levels of activity could prove productive, especially if targeted at specific causes.